Unforgettable VIDEO, photos, and veterinary records prove widespread malpractice through unregulated over-vaccination, pharmaceutical pressure and greed. Millions of people have lost their companion animals due to ignorance and/or callous disregard for animal health and the deleterious effects of unscientific, unsafe and unnecessary vaccinations. This dog was vaccinated every year even when experiencing blood in the urine and a 21 pound weight loss. She even received vaccines while on chemotherapy, plus antibiotics and steroids that deregulate the immune system. The dog’s owner had to get another job in order to keep up with the drugs and veterinary costs used to "treat" the results of vaccine induced disease. The dysregulation of the immune system was so great that the dog was finally euthanized. This is what happens every single day in vet clinics across the US. A summary of the dog’s records show that she received repeated injections of what some vets now refer to as the “mumbo jumbo combo”. Forward-thinking, outspoken vets such as Dr. Ron Schultz state why the animals should not be subjected to what Dr. Jean Dodds refers to as whombo combo. 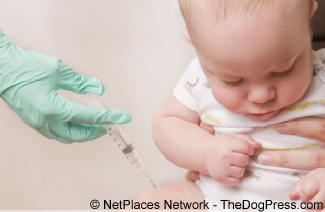 "Combo vaccines containing multiple live and killed virus with bacterins, mercury and adjuvants can do irreparable damage to the canine immune system." Many times in her life, this German Shepherd received the mumbo jumbo combos in combination with Lyme vaccines and with rabies which is the most reactive vaccine. Records show she was often administered steroids at the same time which is contra-indicated as immunosuppressive. Dr. Ron Schultz, Dr. Richard Ford, and many other veterinarians have stated they don't recommend the Lepto vaccines. The reactivity associated with Lepto vaccine can make a patient very itchy for three to four years and most agree, the vaccine is incapable of protecting a dog against Leptospira and worse yet, if the dog were to develop a Leptospira infection to one of the serovars transmissible to man, the owner would be at greater risk of suffering a Leptospira infection because his/her dog was vaccinated! We can be sure that the owner was never given Informed Consent to sign nor provided with Full Disclosure of what these vaccines would do. Dr. Ron Schultz only recommends vaccination one time at 15 weeks of age for dogs and only distemper, adenovirus and parvovirus. It is proven that IgE hypersensitivity results and the animals can suffer much greater allergies as a result of being vaccinated. Not only this, the thyroid is suppressed as a result of vaccinations for at least 45 days following vaccination. Vaccines were administered to this dog in 1998, 99, 02, 03, 04, 05, 06, 07 and 2008. Most vets would agree that is way too much. Since 1978 Dr. Ron Schultz and Dr. Phillips have reported that repeating vaccines has no scientific basis. In addition, it is a violation of the FDA requirements that the animal to be vaccinated is healthy and not suffering from any disease. 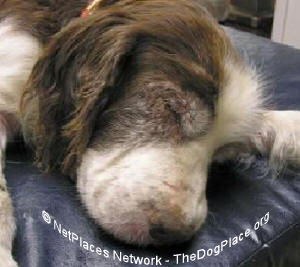 Even so, records indicate that by 2005 this dog was ill and given antibiotics at the same time. Rabies vaccines cause auto-immune disease, antibiotics cause auto-immune disease, and then we also have induced munosupression at the same time! Vaccinated in 07 again while diseased, this time with hematuria (blood in the urine) and when the patient was suffering from an unexplained 21 pound weight loss! 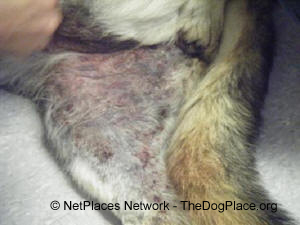 Records show as of 05/01/07 platelets are low and are clumping which could be immune mediated or inflammatory, and on 05/14/07 the dog was put on aspirin! 08/02/07 shows an increased dose of aspirin and she was also on Cosequin and the poor dog was given long acting immunosuppressive STEROIDS (contraindicated with aspirin, a non steroidal anti-inflammatory) and antihistamines were also prescribed! 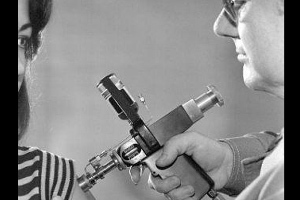 There was no work up of the skin condition that had progressively worsened with every immune assault, no doubt caused by this over administration of vaccines. No thyroid testing despite signs of thyroid disease. Oct 07 saw even more $teroids, long acting stronger antibiotics (remember antibiotics are suppressive in nature) which no doubt exacerbated development of auto-immune disease. Nov 07 she was given even more (!) long lasting immunosuppressive $teroids, both by injection and by oral administration. By 12/07, records note ATOPICA, a chemortherapeutic agent which is destructively immonsuppressive! And more Ciproflaxacillin and even more long lasting steroids in the face of notes that tell all: “pyogranulamatuous inflammation. Atopica; 12/24/07” and incredibly, on 3/31/08 the patient gets shot up with a whole slew of vaccines, including the mumbo jumbo combo even though at this time she is noted to be “sick with fever, chronic dermatitis, crusts, scabs, pustules”. And the dog gets another steroid injection. All this was done despite the low thyroid level which doesn’t appear to have ever been addressed, and FDA violations of administering vaccines to a very sick animal. The second dog again was so immune dysregulated from years of vaccines that he presented with immune exhaustion, adrenal fatigue and as the immune system failed, coccidia and yeast infections went out of control. 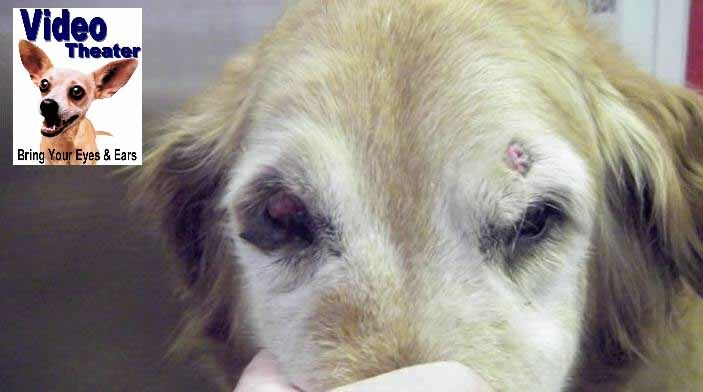 This dog had a paralyzed cell mediated immune system, an atrophied mucosal immune system, and ultimately, the beloved companion became unable to live. Photos. Are they worth a thousand words? What more could be said about the harmful effects of over-vaccination? Why do $dollars seem to rule the Veterinary associations as our closest companions are “treated” this way? Stay tuned, literally, click this photo to watch short video Death By Vaccine Induced Disease in VIDEO Theater, featuring Dr. Patricia Jordan. The Video will open in a window so that, having seen the horrors, you return to learn more in Vaccine Reaction Tumors-Photos, a case study by Dr. Patricia Jordan. Be alert for vaccine-related anaphylactic shock in puppies too. 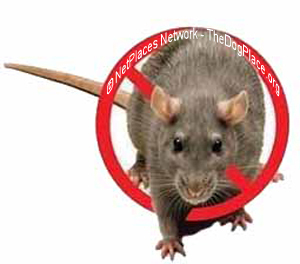 Does leptospirosis risk outweigh the risk of lepto vaccine? Vaccine-Induced-Disease means more trips to the veterinarian!